Electrolyte testing on bicarbonate dialysate includes Sodium, Potassium, CO2, Magnesium and Calcium. 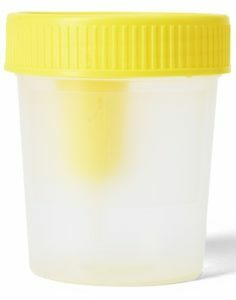 Using sterile technique, fill a Sterile Cup with Transfer Port (Yellow) 3/4 full. Peel back the protective seal on the Cup’s lid to expose the Cup’s transfer port. Insert the stopper of a Black Top Tube into the Cup’s transfer port. This will pierce the stopper and allow the tube to automatically fill. Allow tube to fill until flow ceases. Use the barcode label to identify the specimen. Place the labeled tube in a plastic Transport Bag with an absorbent sheet and seal shut.